Whatever standard you are playing, it’s almost certain that you could raise your game by improving your fitness a bit more. That’s because fitness is a key component of being an effective performer on the court, and is every bit as important as your skills with the ball. For some, maybe those just starting out, the challenge of building fitness is just to be able to make occasional runs up and down the court without feeling like it’s going to trigger a cardiac arrest! For those who are more experienced, the challenge is more about how to take your fitness levels from ‘average’ to ‘impressive’ – which really can make all the difference between being a steady player to being that one person who controls the court. When it comes to improving fitness levels, we’re all inclined to want a quick-fix. 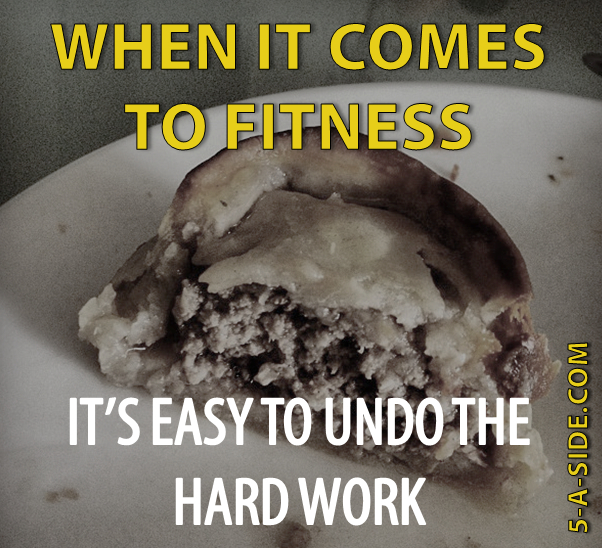 It’s one of the reasons why there are so many gimmicks and fads out there in the fitness industry. But the secret to really getting fit for the court doesn’t lie in any one particular drill, nor does it rely on any effort-free solutions. 1. The best way to get fit for 5-a-side is to play it! The answer to getting fit for 5-a-side might be more obvious than you think. If you’re already playing the game and you’re finding it HARD on your fitness then congratulations, you’re already taking a great step in getting fit! 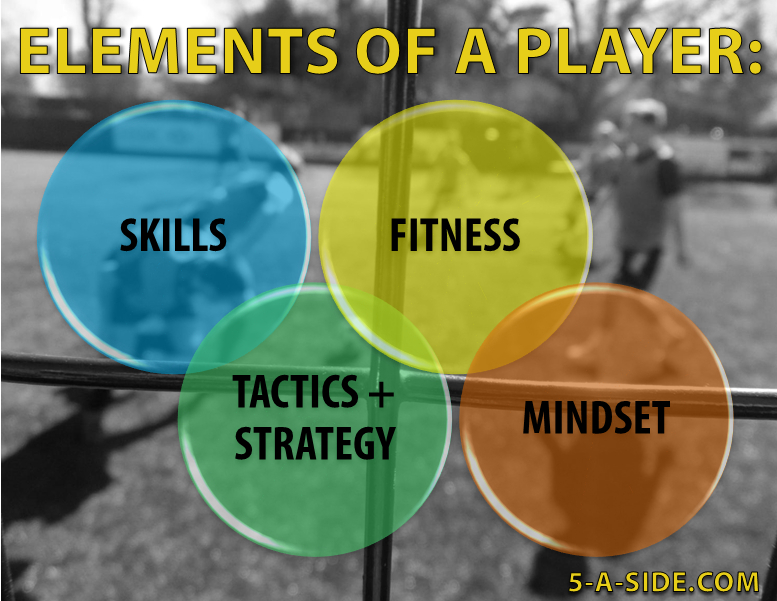 The truth is that forms of 5-a-side soccer are truly phenomenal for improving your fitness. Studies have shown that playing 5-a-side does more for your physical health and fitness than simply jogging so why not abandon the pavement-pounding and get fit doing something you actually enjoy? It has even been found to be better for your fitness than playing the full 11-a-side game because it requires you to spend a higher proportion of time in your maximum heart-rate zones. Many people also find it a much more enjoyable way of getting fit than individual training – when was the last time you went for a drink with your fellow joggers just to discuss how enjoyable the run was? Not often, I suspect – but people do this all the time after football. That’s not to say that other sports and exercises aren’t useful for building your fitness levels, but the fact is that small sided soccer can require a different intensity and more specific muscle requirements than other sports. So, simply, play more 5-a-side and you’ll find that you start to get fitter for it. Simple. Even if you’re playing 5-a-side, it will only help you get fit if you’re actually pushing yourself. Strolling around without breaking out of a jogging pace won’t do much to improve your fitness (or your teammates’ opinion of you). If you want to build fitness on the court then you have to put in the hard work. The same principle goes for when you’re off the court doing any other fitness training – you really are not making any meaningful progress unless you are pushing yourself. The value of pushing yourself hard in your workouts is becoming recognised widely in the fitness industry now. It is this principle that has spawned a whole school of exercise called “high intensity interval training” (HIIT) – or Fartlek training, a similar variation. The principle is that by doing very high intensity exercise in short bursts, taking rests in-between, you can get much more impressive fitness results when compared with performing longer periods of more gentle exercise. The key is this: it’s not just the length of time you spend working out that counts; it’s how much you’re pushing yourself which is the crucial factor. If I had a penny for everyone who claimed they wanted to get fit but then gave a hundred different excuses of why it was too difficult for them, I’d very quickly have enough cash to put a transfer bid in for Cristiano Ronaldo to join my 5-a-side team. The truth is that these ‘fitness-dodgers’ are full of excuses because they aren’t truly motivated to get fit. Yes, it’s a nice idea in practice but when it comes to putting in the hard work and implementing a plan, they’d rather be doing something else. At times, getting fit can be HARD and when temptation comes sniffing around your door, it can be easy to give in and lose sight of what you are trying to achieve. To make sure that does not happen, work out exactly what it is you are trying to achieve and, more importantly WHY you want to achieve it. Maybe your motivation is to be able to dominate the 5-a-side court, or maybe it’s to get in shape for summer. Maybe you just need to make a positive change for the sake of your own health, or for the sake of your family; maybe you’re just sick and tired of all that excess weight you are carrying. Without really knowing why you want to get fit, you won’t be totally committed – which sadly means that you stand a good chance of failing. When you work out what your motivation is, grip on to it tight and visualise what success will look like when you get there. By keeping that goal in mind and making your motivation strong enough, you can bullet-proof yourself against the attacks of laziness, discouragement and temptation. Having the willpower to work out and the desire to push yourself is going to be a lot easier if you want to do it, because it’s something you enjoy. Of course, the enjoyment factor is a major reason why we suggest playing 5-a-side as a way to get fit, but for practical reasons you might want to supplement this with some other form of other exercise, and if you do, make sure you pick something you enjoy. There is no point sending yourself on long 10 mile runs if you find it boring and grow to dread doing it. Work out what YOU enjoy doing and it will enhance your motivation to do it. Whether that be swimming, cycling, boxing, or any one of hundreds of other ways to get fit – make it work for you; it will be a lot easier that way. A lot of excuses on why people “can’t get fit” revolve around not having enough time and/or opportunity. However, these complaints usually just illustrate a lack of desire to really get fit. 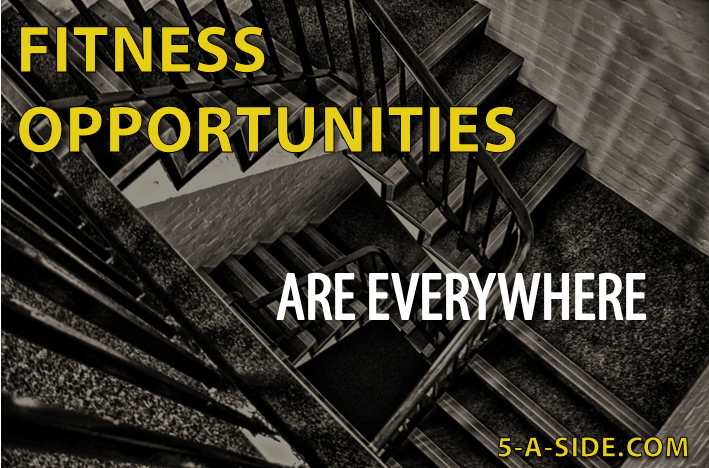 Using your more positive, motivated mind-set you will see opportunities everywhere. Can you walk to work instead of taking the bus? Can you cycle instead of driving? Do you work on the 4th floor of an office block – how about a brisk climb up the stairs instead of using the elevator? None of these might transform you into an iron man, but they might just make that little difference to keep your fitness levels up and give you the edge over others. More than that, constantly looking for fitness opportunities helps keep you in a positive mind-set and focussed on your goals. Don’t let your aspirations get swallowed up by wishy-washy goals. A lack of target setting can quickly become your undoing when it comes to getting fit. You need to set targets in order to make yourself accountable. What is it that you are trying to achieve, and by when are you trying to achieve it? Keep it realistic, keep it specific. If your goal is to get fit for 5-a-side then you can work out exactly how fit you need to be with the help of this article: how fit do I need to be for 5-a-side. There are lots of ways to measure your fitness, and it’s an important part of the process of getting fit. Being able to measure your progress gives you tangible results, and the positive feedback you get from having made progress can give you a huge buzz of motivation! Use whatever tools you need to: be it the time it takes you to run 5km; the level scored on the beep test / yo-yo test or maybe the weight you have lost. When you see your times coming down, or those pounds dropping off, you’ll see that there is motivation in measuring. Try to set some regular time aside. Find what works for you – mornings or evenings; maybe on your lunch hour at work. 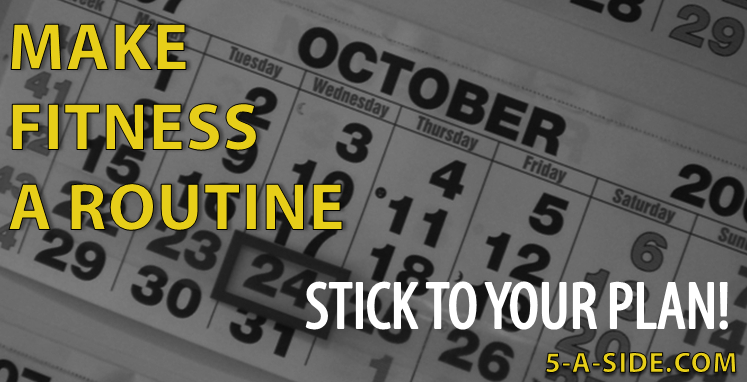 Then hold yourself to it and keep these appointments sacred – do not allow yourself to schedule over these slots. Sooner or later, even with the best will in the world, plans tend to suffer a setback. Not everything goes right first time. Whilst you don’t want to let yourself get into this situation, you shouldn’t beat yourself up when your first setback comes along, and definitely don’t abandon your plans all together. Feeling bad leads to giving in but avoiding this guilt can make you stronger. You might be familiar with the story of Spaniard, Hernán Cortés de Monroy y Pizarro who in 1519 went on expedition to Mexico to get gold and silver. Sensing that his crew were hesitant to leave the safety of the shore where they always had the option of retreating to their ships to fall back on, Cortés had all the ships burned down. Obviously not a guy to mess about, Cortés knew that in order to fully focus himself and his men on their goals of plundering silver and gold from the Mexicans, all thoughts of quitting needed to be thoroughly eliminated. The lesson from Cortés is that in order to enhance our own focus on our goals, we need to eliminate those things holding us back and make sure that failure isn’t an option. This doesn’t mean that you should go setting fire to your oh-so-comfy couch that you spend too long sitting on, but it might mean that you need to eliminate some temptation foods from your house, or that you boldly announce your fitness goals to friends who you know will hold you accountable – make it difficult to fail! It might sound obvious but if you are doing an hour of exercise and following this up with several pints of lager and a kebab, then you are more than likely undoing all of your hard work. Imagine your body is like a car. If you want it running well then you make sure that you give it the right fuel (your food and drink), make sure it gets repaired regularly (get enough sleep), and never let it be seen with smoke coming from the hood (quit smoking). Before you go launching into any strenuous form of exercise, make sure that you warm up properly. The warm-up is a frequently neglected part of 5-a-side but it a key part of making sure that you stay injury free. The warm-down is also an underrated concept. The 10 minutes it takes after a game to do some gentle exercise (such as light jogging or walking), stretching and making sure that you re-fuel properly (eat and drink something within 1 hour of exercise) can be a big help in staying injury free and developing flexibility. If you are really trying to increase the level of fitness work you do then warm-ups and warm-downs are vital to make sure that your body doesn’t succumb to injury from the increased workload. If you want to get fit for soccer then your training is most effective when you are doing something that has similar specific requirements. Other forms of exercise, such as Pilates or Boxing can be complementary to your training and are likely to enhance your soccer fitness, but just doing those sports alone will not get you fully tuned up for soccer. If getting fit for 5-a-side is your goal then try to work out the specific muscle groups that you need to play it, and try to make your fitness work mirror the requirements of a game (i.e. short, intense bursts of speed in your high heart-rate zones, with brief rests in-between). Fartlek training (yes, that’s a real term) can help with this. If your quest to get fit for football has arisen as a result of you suffering an injury that has kept you out of the game for some time you must be very careful about how you manage your road back to recovery. 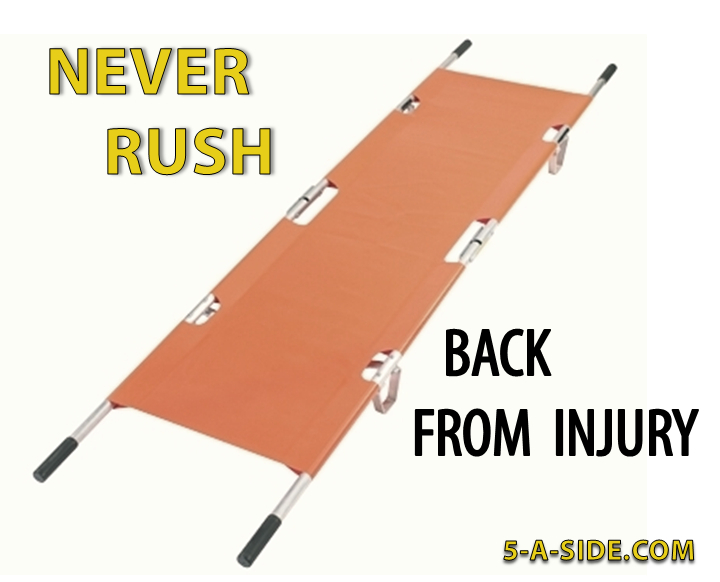 Always start gently after an injury and make sure that you never push yourself beyond your capabilities. Remember that 5-a-side is an intense sport and you should not play it if you are injured. Rushing yourself to return to playing too quickly is false economy: trying to shave a week off your recovery schedule can often result in many more spent suffering with a relapse of the same problem. I’m now 59 and have been playing 5’s regularly since I stopped playing 11,s in my early 40’s. However not being from a generation who placed value in warming up properly and having missed weeks of games with regular calf strains and the misery at missing games this can bring and most recently returning ftrom a fractured collar bone [ not 5,s related]. This article on fitness and warming up is all the motivation I need to get back to the game I love. Tam, I feel inspired by this post. If this site just gets one person fired up and back into football then that will be all I ever wanted! Why not make that your goal in 2016. I’ll email you more about it – check your mail (in case it goes into the spam folder). Cheers! Very good article. One thing that people overlook is the idea of incremental change over time. Too many people (me included at times) can put off exercise as they feel that it is a massive undertaking and a big change in their life. They feel that they have to set aside an hour a day to work-out and big changes like this can easily extinguish any motivation they may have. The idea that you make small changes and work on them to become habits over time is they key to success. As you point out, play a regular game once a week to start with, something you have to commit to but is not a huge life-changing taks. Once that becomes a habit, focus on what your eating. For example, start to track your food on a daily basis. The task of tracking will raise awareness of what you are putting in your body and make healthy eating a habit. Then move on to the next thing. The idea here is that you make small, easy to implement changes, making them habits and adjusting your lifestyle over a long period of time.